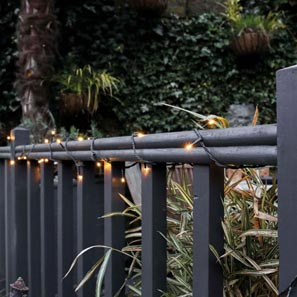 Indoor & Outdoor PowerBee Offer a Full Range of Energy Efficient led string Lights, Connectable, Weatherproof, & Work All Year Round in UK. USB charging ability, easy change strings, and multi function operation, everything you need to add magical lighting. Add a Twinkle to your Spaces with String Lighting. Add sparkle & happiness to Your home & garden with twinkling Led lights, the latest trend sweeping the UK. With latest technology Led's its now possible to have gorgeous mood setting lights anywhere you need. Our outdoor Christmas tree lights are stunning. Weather resistant connectable rubber cables allow you to choose almost any length you need. Choose the category of Lights you need whether it is to create a cosy feel for the bedroom, or a sparkling wonderland outdoors. We have the lights to cover your needs. Powerbee offer a range of options from battery power, solar power, low voltage and commercial connectable 240v we have it covered. Its great to enjoy Your accented garden sitting outside with a glass of wine, its also very comforting to look out and enjoy them from within Your home. Your field of vision is opened up to a greater area making you feel like you are living in a larger space, more in control and happier. Choose Your Style of Fairy lights. From summer fun to commercial installation we have the lights you need. Our range has cheaper solar sets which are very easy to install. We also offer commercial grade rubber cable strings for high street displays. Simply choose which category you are interested in then click on to the product, and view the specifications tab for all the information you need. The new generation of led strings are very easy to install and use, they have in most cases timer functions so that you can set & leave them. They will automatically come on when you want them to, leaving you free to manage other things in your life.